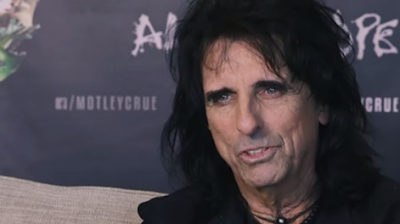 MetalRockNews: Alice Cooper about Donald Trump: "It's going to be the funniest election of all time"
Alice Cooper about Donald Trump: "It's going to be the funniest election of all time"
Alice Cooper was recently interviewed by "The Strombo Show", you can read some excerpts below. About the 2016 U.S. presidential race, Cooper said: "It's so funny to think about Donald Trump and Hilary. It's going to be the funniest election of all time. I mean, think of it. I keep thinking to myself, is this really the best we can do? With all the great minds in America, this is really the best we can do?" He continued: "The thing I think about Donald Trump and I'm not political at all, but I know Donald and I know he's doer, he's not a sayer, he's a doer. I think that's what the American public are looking at. The American public always votes with their wallets. They're looking at a guy and going, 'Why don't we put a billionaire in there that knows how to run a business? Because America is basically a corporation, and that's what they're thinking right now. They don't want some vanilla politician in there anymore doing business for us that's milk toast. They want a guy that is going to do something. I don't know how much he knows about foreign policy and that's what worries me, and I think it worries a lot of people."